Home / Behind Enemy Lines / CPAC / Gene Berardelli / Russell Gallo / SABO / CPAC 2015 - Sabo! "I am the fastest censored street artist in the city of Los Angeles. I am not a Left-WIng-Zombie-Artist. I am on the edge, the only true rebel artist in LA." $#!T just got real for our CPAC 2015 coverage here Behind Enemy Lines. He may be the most controversial interview we have ever done - or will ever do. Conservative street artist / activist Sabo will join Russ and I for what is sure to be a memorable interview. 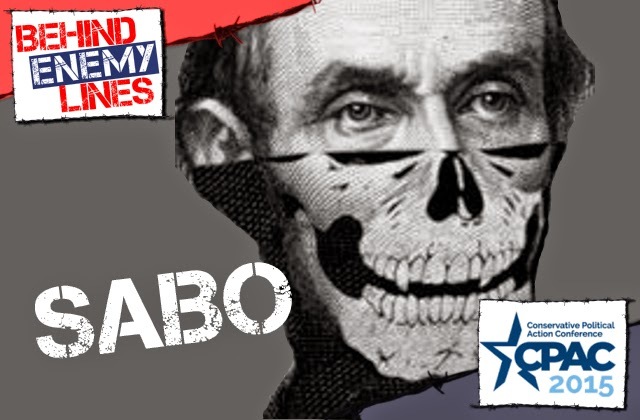 Sabo is an LA street artist, former Marine, and self-professed Hollywood Republican who grew up in Texas and Louisiana. The Marines weren't exactly where he fit, so he turned to his passion for art. Then, it began to intersect with politics. Quite simply, Sabo feels Republicans and conservative have a great message to spread, but just doesn't it do it right. Particularly, Republicans' refusal to counter attacks from the Left are what drove Sabo to act. And boy, does he ever act. His chosen weapons, passionate and provocative imagery and an acid, acerbic and unapologetic wit that he spreads throughout social media (which leads to his run-ins with those gatekeepers as well - he is currently languishing in "Facebook Jail" as they've suspended his personal account. I'd love to write more, but I am going to go buy my Sabo print of choice so I can bring it to CPAC to get it signed by the man himself! Don't miss this awesome interview - or any of our other guests like Kevin Sorbo, the Benham Brothers, Van Hipp and so many others! And come back later today for another great guest announcement!